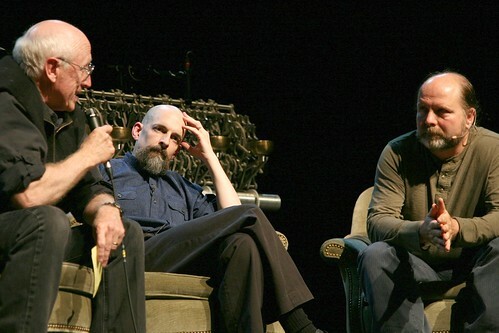 Photo of Stewart Brand, Neal Stephenson and Danny Hillis by Jacob Applebaum. From the Anathem book launch event that Long Now hosted in 02008. Long Now would like to thank author Neal Stephenson (author of Anathem, The Baroque Cycle, and Snow Crash amongst others) for contributing to the Long Now Salon. Neal’s generosity helped us surpass $185,000 in funds raised for Salon construction. We are especially thrilled that he will be speaking in Entish when he visits. In the past week we’ve also received gifts to the Salon project from two other noted authors: scientist and Hugo, Locus, Campbell, and Nebula Award-winning science fiction writer David Brin, and former Editor in Chief of Wired Magazine Chris Anderson the author of The Long Tail, Free, and Makers: The New Industrial Revolution. Thanks so much to them and to more than 130 of you who have contributed to the Long Now Salon so far.